This session focused on Plymouth Connect. The session involved a presentation from Jean Almond on the key functionality of the platform and an overview of how it can be used by a student by Mark Beresford. Key questions that were posed to the student focus group surrounded promotion of the platform, how to improvement engagement and the naming of the platform. 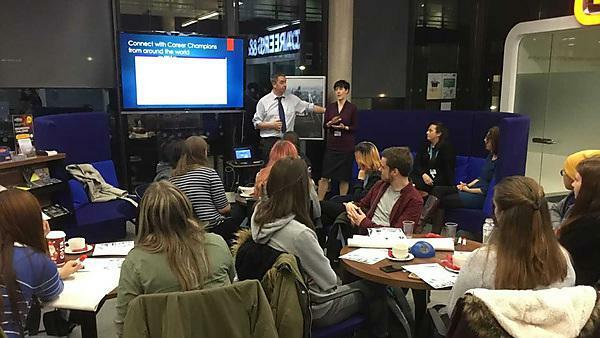 The main topics of discussion surrounding promotion of Plymouth Connect were concerned with how students could be engaged through their programme of study, through to promotion in the wider campus, events and the Plymouth App. Each team discussed various touch points in which Plymouth Connect could be advertised comprehensively across the University of Plymouth student body, which importance raised for academics to have an awareness to share with students. One group suggested that including Plymouth Connect on the University app and SU app, placing it near to the Careers Service app, would help drive awareness. The banner that traverses across the DLE pages was also a suggestion to help embed Plymouth Connect into the psyche of all students and make the page easy to access. Success stories were an element that groups felt would help promote the platform. For example, quotes or profiles from students who have used the platform and then had success with job searching, career planning or even receiving a job offer. Course reps and student ambassadors were also a positive suggestion to help support the promotion of the platform. Events were suggested as a key way to promote the platform, particularly those that had alumni invited to them as speakers or for networking. The aim would be that alumni could speak about their experience of helping or connecting with students on the platform. There was also the suggestion that at student attended events there could be a ‘Connect Corner’ which had an iPad, allowing students to register ‘there and then’, particularly if they have just had a talk about its use. LinkedIn articles were also suggested as a way to promote the platform, using the aforementioned success stories or profiles, students suggested that it would be a positive way to connect with students. If there is a LinkedIn group or the articles were posted by careers/alumni staff who are connected to the student body, this would help promote the platform (whilst also connecting students in other ways, to alumni and to each other). Students felt that an ‘Alumni of the Month’ or similar profile on social media and careers webpages, would be a positive step. An important factor to the international students and EU students in the group was that it is expressed in promotion that the platform is international and that there are international meet-ups. This was not something they were aware of and felt it could be a positive and strong selling point for the platform to gain users. A recurring element of student feedback has been a careers resource folder on induction, with information to use throughout the year. They suggested that the Plymouth Connect information could also be included here. Promotion during Freshers was an important factor for most groups. A suggestion was also made that this could be made an optional function during enrolment (alongside career registration). On the platform enrolment form one group suggested that there could be a ‘refer a friend’ scheme, so that when one student signed up they could let a friend know they had done so. If possible, students also felt that if promotions could be course or school specific (highlighting alumni from their programmes) this would encourage a sense of specificity to the project. The posters and images were well thought of by the group, with the suggestion that RLB may be included as one of the buildings in the image. Some students felt that the posters were too ‘wordy’ and that leaflets could be more detailed. A small talk at graduation may also be beneficial. Jean mentioned the information available on graduation. course or school specific promotion to help relatability. The topic of engagement was discussed in regards to how the platform could increase engagement through enhanced functionality, clearer understanding of how the platform is intended to function and increasing support available to students engaging with the platform. Students felt that the platform was positive and something that could add value to their university experience. In the same ethos as the use of Plymouth Award, students felt that having a workshop or drop-in time to help them register or answer questions about how to maximise use of the platform, would be useful. YouTube user guides, alumni profiles and overview videos would be a useful tools for students to watch and get easy information on the different features of the platform. A key topic surrounded how Plymouth Connect varied from LinkedIn, and the discussion was had regarding the differences, mainly this concerned that Plymouth Connect has a range of alumni who have targeted the service to help other students. This help functionality would be most interesting to students, and perhaps a way for a student who did not want to use LinkedIn to still access help and support. If these features could be made more prominent, this would be beneficial, perhaps in promotion, but also through workshops or the aforementioned videos. A help section on LinkedIn or an IM service to ask questions about the platform was also something students felt would be helpful to engage students if they felt stuck (and were more likely to give up using the platform). It was raised that if students did not know what they wanted to do, this could cause them not to engage with the platform. Therefore engaging students with an open Q&A section that all alumni could see, might be positive (such as: how did you decide what you wanted to do?). a help section on LinkedIn or an IM service to ask questions about the platform. Jean Almond suggested Plymouth Connect may be looking at a name re-brand to Plymouth Career Champions. Students were asked what they thought of this and any alternatives. In most cases groups felt that Career Champion was not the right name and felt it could be too intimidating and that they are ‘high up in the hierarchy’.